1. Like Heather, I hate store-bought peeps. So gross. 2. This is all the work of Heather. 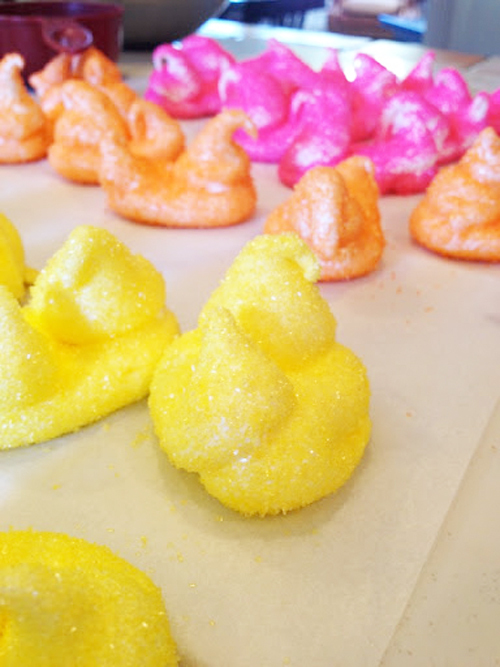 She and her sister got together to make peeps for her niece’s birthday. But we can show you how it’s done, so let’s get going! 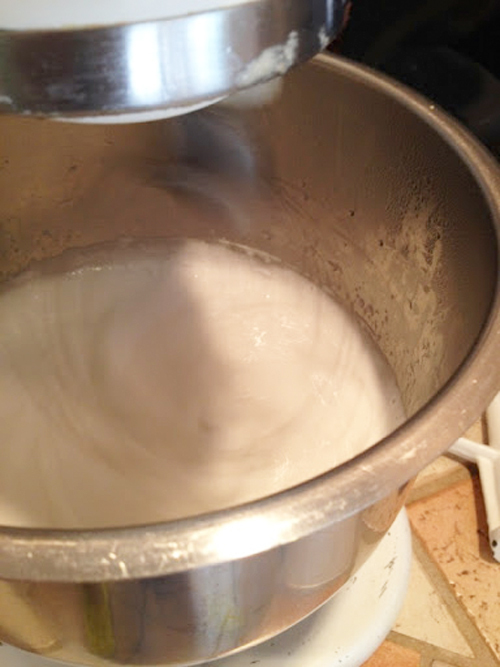 Take your gelatin and place it in the bottom of your mixing bowl used for your mixer. 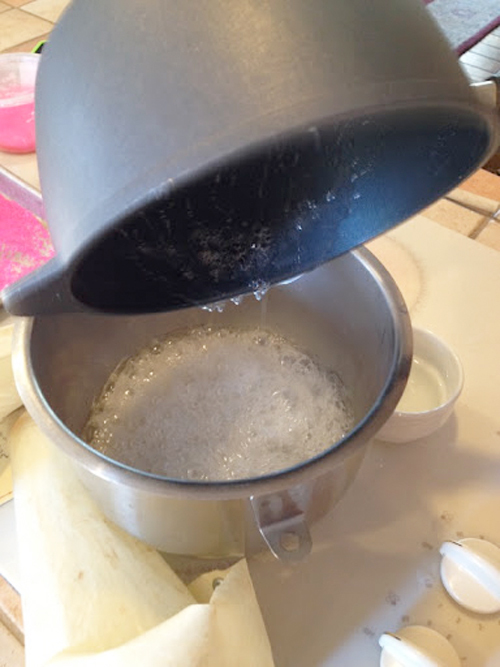 Add 1/3 cup of COLD water and let your gelatin sit in the bottom of the bowl and soften, set aside. In a sauce pan add 1/4 cup water and 1 cup sugar, stir over medium-high heat, making sure that the sugar dissolves. 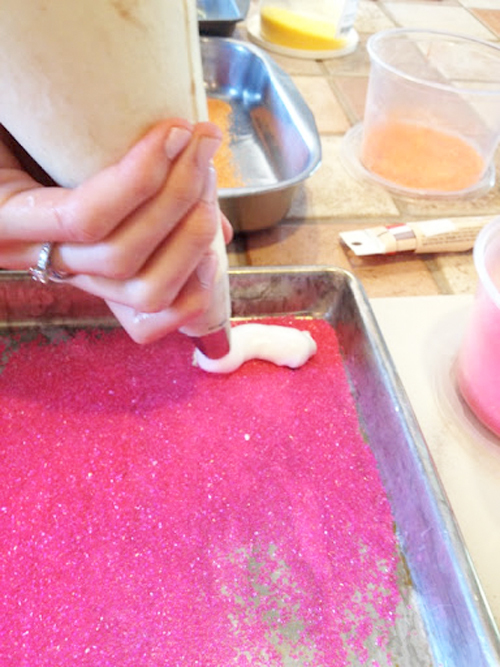 If you get sugar up on the sides make sure to use a pastry brush and water and wash down. 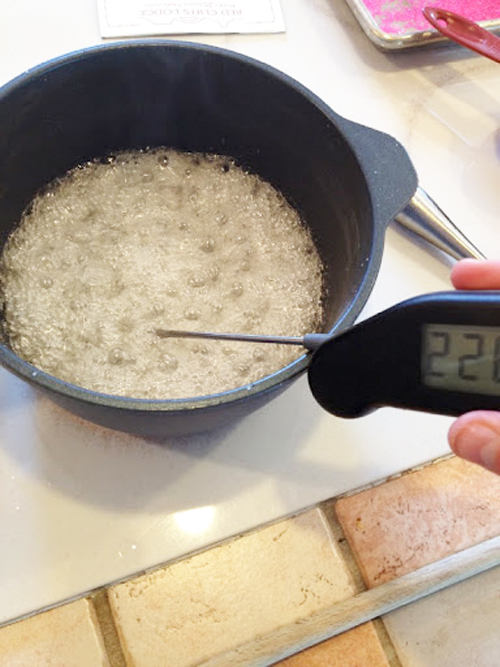 Once all the sugar dissolves, place a candy thermometer inside and patiently wait until it reaches 238 degrees F.
Once your sugar mixture has reached 238 degrees F, take off heat and pour into the bowl that has your gelatin and water. 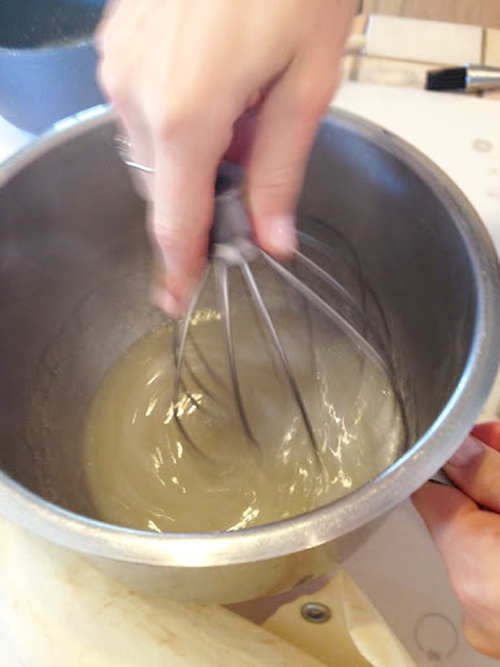 Using the whisk attachment, mix the mixture by hand until it cools down, just for a few minutes. 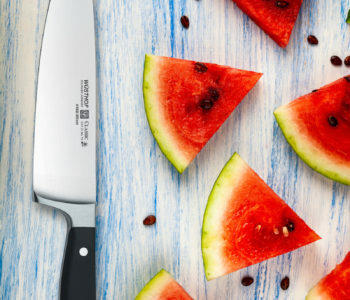 This will help to cool down without adding too much air at first. After a few minutes, place on your mixer and allow it to work its magic. (This is where that mixer comes in handy). On medium speed, beat for 8-10 minutes, or if it is super amazing just watch for soft peaks to form. 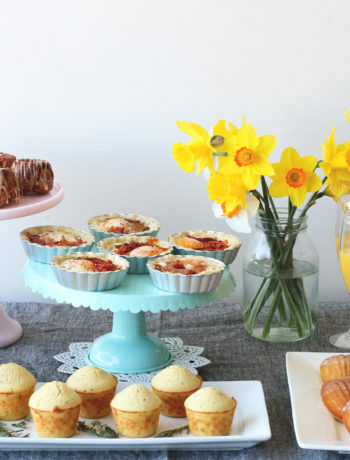 While your mixer is doing all the work, get your pastry bags, tips and sugars ready. We used a 18″ canvas/plastic bag. 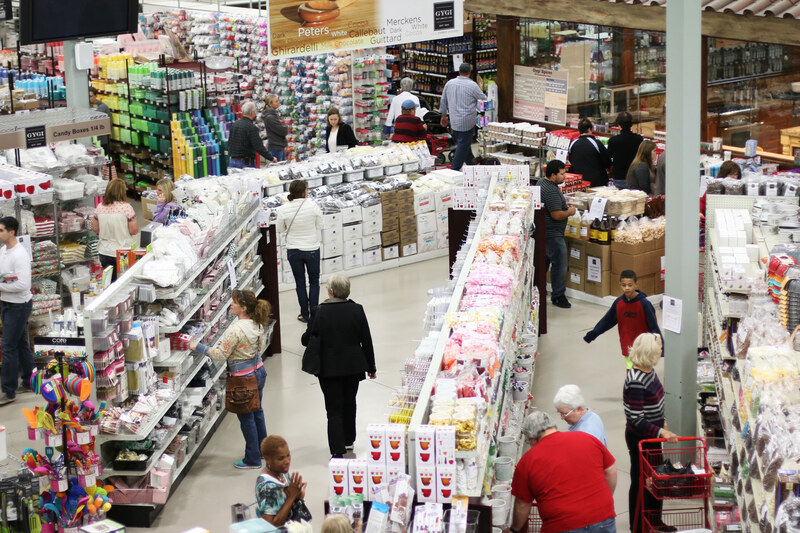 I will let you in on a little trick of mine–use the big bags. When filling bags I only want to do it once, especially when it is something sticky like marshmallow. Trust me, buy a big bag. Then we used an Wilton #1A for the body and a Wilton #11 for the head. Use one bag for each task. Trying to wash out and use another tip will take too much time, and your marshmallow will harden. 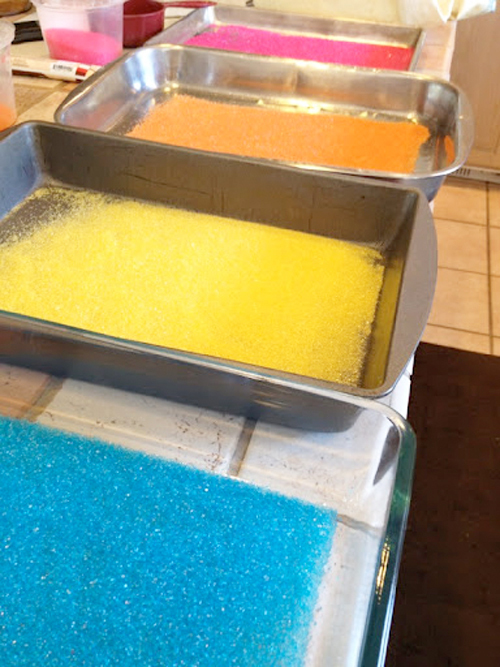 We lined our trays with the fun colored sanding sugars, doing separate colors in each tray. Cute colors, huh. Once your marshmallow has reached soft peaks, this is where you must work fast. Carefully fill your pastry bags with marshmallow. To make the body, use the larger tip, Wilton #1A, and pipe out a small oval shape, trying to get the sides of the oval as close together. We chose to keep the point on the end to make a fun little tail. 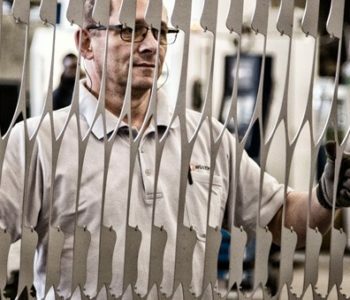 If you get your finger a little wet, you can go over after you have them all piped and try and smooth it down. But our philosophy was: it’s homemade, make it look that way! If we wanted uniform and perfectly shaped ones we could just go and buy them. Once the bottom is piped out, using the Wilton #11, press out some marshmallow on the opposite end of the tail. Press out and then gently pull up towards you. This will form the head and the small beak. Once you have piped all the bodies and the heads, using the sanding sugars pour, shake, and cover your marshmallow with the sugar. 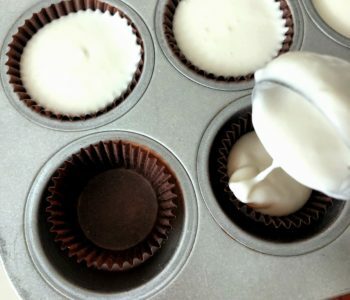 I found out if you get your hands a little sticky then dip your fingers in the sugar, it will coat your fingers, which will make it easy for you to pick up the marshmallow and make sure everything is covered. Work with one color at a time and then wash your hands. It can get a bit sticky. 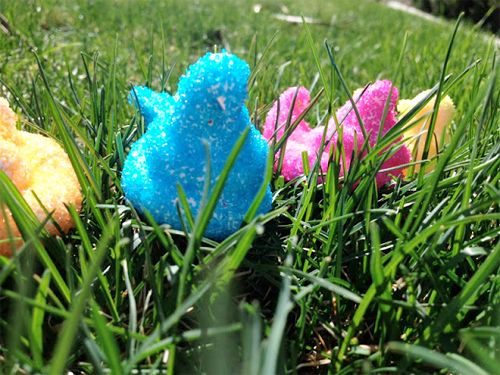 The last few peeps, became a little difficult as the marshmallow was hardening. It wanted to stick to the bag and tip and really wasn’t as easy to work with as the first ones were. So really work as fast as you can with these. It will make them much easier. 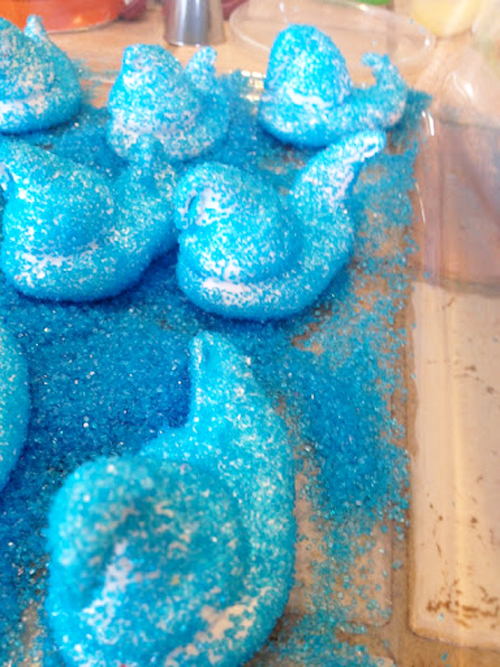 After we covered them all in sugar, we thought we would add some eyes. 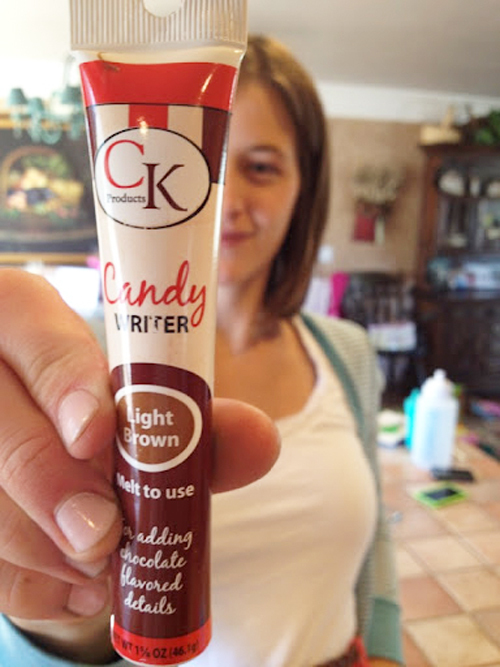 Have you tried the candy writers before? They are chocolate in little tubes and you place the writer in hot water and let it melt the chocolate. You then cut off the tip and you can write, decorate, and have fun with chocolate. You could do it with royal icing, but I really dislike the taste of it, so we went with chocolate. They do come in a bunch of colors too! But after a few eyes, we decided we liked the look of them without the eyes! So we left them eyeless–remember we went homemade looking! But overall, it was a simple task. Two people make it super easy and fun. 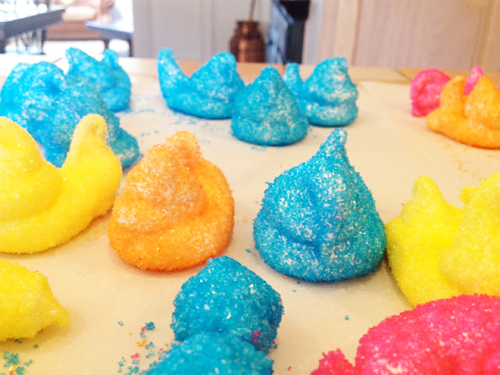 We made 40 peeps in less than an hour with the two of us (we doubled the recipe- the recipe posted will make about 20). 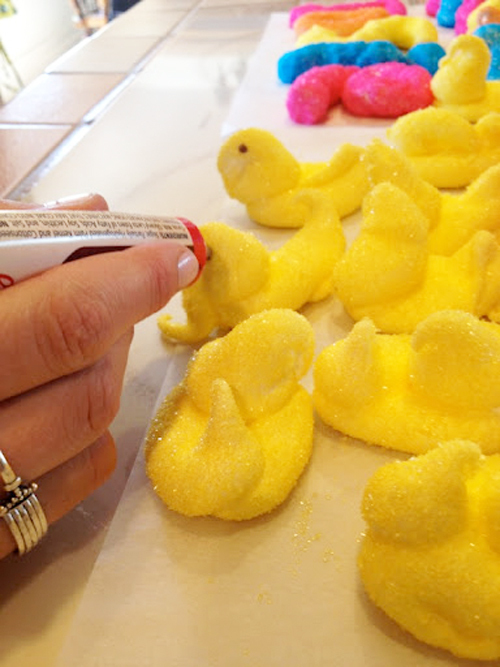 After making them I must say- they taste SOOOOO much better than store bought Peeps. I actually would eat a whole one of these. Although my favorite Easter treat will continue to be the Reese’s Peanut Butter Egg–how do you compare the two? I think I will make them again. Possible in fun shapes, and maybe even flavor the marshmallow. Use a really yummy subtle flavor that will have people begging for more! Favorite Valentine Cookies It's Gygi Grilling Gala Time!